GODEFROY DE NORMANVILLE, THOMAS, interpreter, brother of Jean Godefroy de Lintot; b. c. 1610 at Lintot in the district of Caux, Normandy; d. 1652 in the Iroquois country. 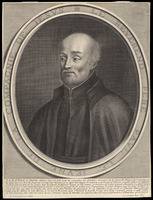 Thomas Godefroy arrived in New France about 1626, together with his elder brother, Jean Godefroy. 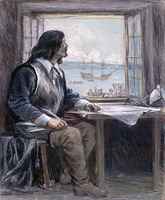 After serving Champlain as an interpreter, he went to live among the Indians while Quebec was under English occupation from 1629 to 1632. When the French returned he settled in the Trois-Rivières region, as did his brother and his relative Jean-Paul Godefroy. But, unlike these, he continued to act as an interpreter. Normanville was one of those go-betweens or interpreters (truchements) of the early days of New France who were so well able to reconcile the interests of business and religion. One often finds him assisting and even replacing missionaries; he catechized Indians, led them in prayer, sometimes even baptized them. Speaking Algonkian, Iroquoian, and in all probability Huron, he rendered invaluable service to the colony. His bravery was well known. On three occasions he fell into the hands of the Iroquois: in February 1641, when he was captured with his companion, François Marguerie; in the spring of 1648, and in August 1652. On the first two occasions he escaped without too much difficulty. In 1652, however, the Iroquois carried him away to their cantons and killed him. 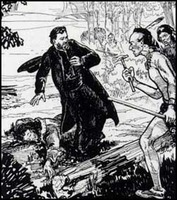 In 1641–42, Normanville had accompanied Father Paul Le Jeune to France on a trip made for “the common and public weal of the colony,” and in 1651, he, along with Father Buteux and three other Frenchmen, had been the first white men to travel up the St. Maurice River as far as the territory of the Attikamegues. APQ, Coll. de piéces jud. et not., 2158. Dollier de Casson, Histoire du Montréal, 66f. JR (Thwaites), XXI, 23–45, XXIV, 197, XXVII, 263, XXXVIII, 59. Papier terrier de la Cie des I.O. (P.-G. Roy), 287. P-G. Roy, La famille Godefroy de Tonnancour (Lévis, 1904), 118–23. Sulte, Mélanges historiques (Malchelosse), XI. André Vachon, “GODEFROY DE NORMANVILLE, THOMAS,” in Dictionary of Canadian Biography, vol. 1, University of Toronto/Université Laval, 2003–, accessed April 22, 2019, http://www.biographi.ca/en/bio/godefroy_de_normanville_thomas_1E.html.